Need Sleep Help? This sleep canopy will provide an excellent sleeping space giving you moderate to high level of protection from EMF that abounds in your bedroom and in your neighborhood environment - EMF that is scientifically well documented to cause sleep disorders and much more. EMF protection couldn't be simpler, simply purchase a ready made EMF shielding canopy, like the one illustrated here, and hang it from a ceiling hook, and you are ready for an electronic pollution free sleep. Why safeguard your sleep space from EMF? 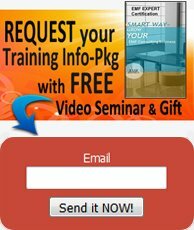 Studies have shown that sleep disorders and a wide range of sleeping problems share a well established link between EMF (Electrosmog) and numerous other “diseases of civilization” such as Alzheimer’s, Neurodegenerative Diseases such as Parkinson’s, and ALS (Lou Gehrig’s Disease), depression and suicide. of all Sleep Disorders - Electrosmog! If you need sleep help, you will first of all want to look into clearing your sleeping environment of all sources of Electrosmog (EMF or Electronic Pollution), such as electrical appliances, wireless technology and cell phones and do what you can to block environmental EMF sources such as power lines, cell towers, airport radar and more, that beam EMF right through your bedroom walls as though they weren't even there. The USA National Library of Medicine for the National Institute of Health website puts it this way, “Electro-biological research of sleep showed that EMF at night has more severe effects on health in comparison to EMF radiation in day time. Poor sleep quality has been associated with increased tension, irritability, depression, confusion and generally lower life satisfaction. Poor sleep quality reduces longevity from 80 years to 65–70 years, and is associated with numerous health problems (gastrointestinal disorders, depression, exacerbation of chronic disease). Extremely low electromagnetic frequencies are in the same frequency ranges as our brain waves”. Being exposed to EMF during the day is one thing, but being exposed to it at night, while we are defenseless for hours in sleep, is quite another. 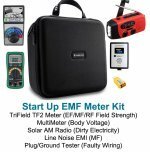 EMF disrupts our cell function, including our neurons, or braincells, to the point where our sleep is not restorative, our immune system never becomes fully functional, and our health begins to suffer as our physical, emotional and mental processes begin to break down. 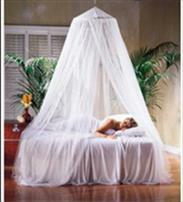 Fortunately an EMF Shielding Bed Canopy like the one above is a great sleep help solution. Another solution is to BUILD YOUR OWN BED FRAME to use with EMF BLOCKING DRAPERY to create an EMF-free sleeping zone. Here's a bedframe you can inexpensively build in an afternoon. 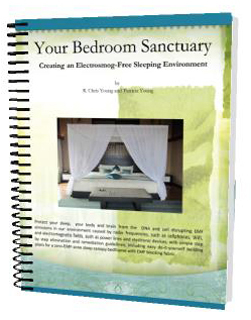 This instant download ebook will show you how to mitigate EMF in your bedroom from all sources, and instruct you how to build an EMF Free Bed Canopy. step by step. These easy how-to instructions will enable you to construct an inexpensive four-poster canopy bed frame structure in an afternoon, using readily available materials, for a total cost of under $70. This DYI bed frame is designed for draping a canopy using your choice of lovely EMF blocking sheer fabrics that drape with no-sew ease, for King, Queen, Double, Twin or Baby Crib bed sizes. Fabric cost depends on size of bed, the EMF-blocking fabric you select select and draping fullness desired and our easy to follow worksheets make it all easy to figure out.